Easter eggs: a chocolaty treat to most but also a hidden pleasure that some video game connoisseurs spend hours, sometimes days trying to uncover. The new Jeep Renegade is, excuse the pun, chock full of Easter eggs. Stare hard at the logo and you'll notice a little jerrycan emblem hidden in the letter 'D', scour the interior and you'll find more jerrycans in the cup holders, take a look at the windows and you'll stumble upon a silhouette of the original 1941 Willys MB army vehicle from which the modern Jeep evolved. 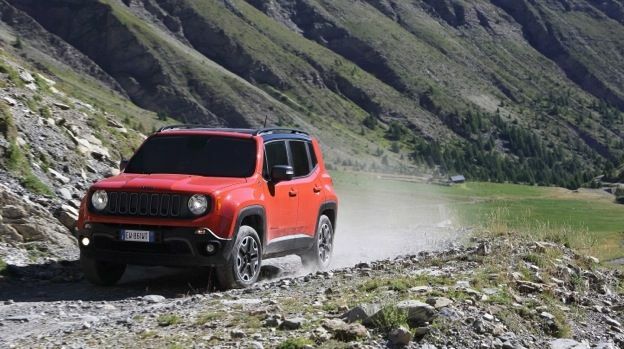 The American marque is extremely keen to remind customers of its heritage and, more importantly, the fact that Renegade is spawn from the original military vehicles, thus trumping its front-wheel-drive SUV rivals with real off-road abilities. Renegade, Jeep's newest compact offering, attempts to rise above the likes of Skoda's Yeti and Nissan's Qashqai with unique Terrain Selec technology - a computerised system that can adapt to a variety of different surfaces and adjust traction and torque according. A similar set-up can be found in a number of Land Rover products but this is the first time it has been seen in the compact SUV segment. Better still, the four-wheel-drive system can disconnect the rear axle when not in use, improving on-road handling and saving the customer money at the pumps. Mud, sand, snow and even rocky surfaces are catered for and a low-range gearbox (another first in the segment) ensures even the steepest inclines and declines can be trampled. The top-end Trailhawk models are perhaps the most tempting; not only are they kitted out with the latest 6.5-inch touchscreen, which runs UConnect software, but also a neat 7-inch colour instrument cluster that sits between the usual speed and rev counter binnacles. Customers can easily pair smartphones, access a number of apps on the move and enjoy online traffic and navigation services. Renegade Trailhawk is also the smallest Jeep to wear the 'Trail Rated' badge - an emblem that denotes serious hours of off-road testing and the ability to tackle even the roughest terrain thanks to raised ride heights, impressive approach and departure angles and reinforced body panels to soak up the scrapes. It also helps that it looks pretty cool. There will undoubtedly be arguments surrounding styling but the Tonka Toy bodywork, flared wheel arches, heavily stylised lights and bright red tow hooks on the Trailhawk model make it look like a giant Micro Machine. It begs the question; do school run mums really need a pumped-up, 'Trail Rated' SUV to take little Timmy to football practice? The answer is probably no, and with an estimated price tag of £23,000 for the range-topping models, it also faces fierce competition from VW, Nissan, Mini and Skoda. Still, it's nice to know it can go off-road, you know, just in case it snows or something.